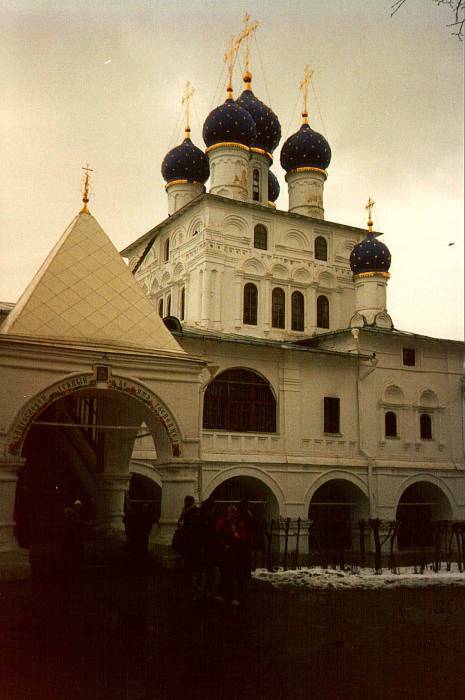 As the earlier page described, I arrived in Moscow the first time on a train out of Warsaw. 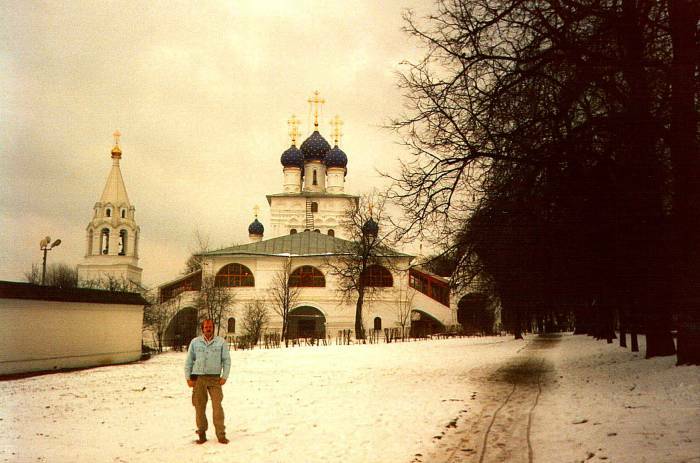 The other times I visited Moscow I went there on overnight trains out of Sankt-Peterburg. 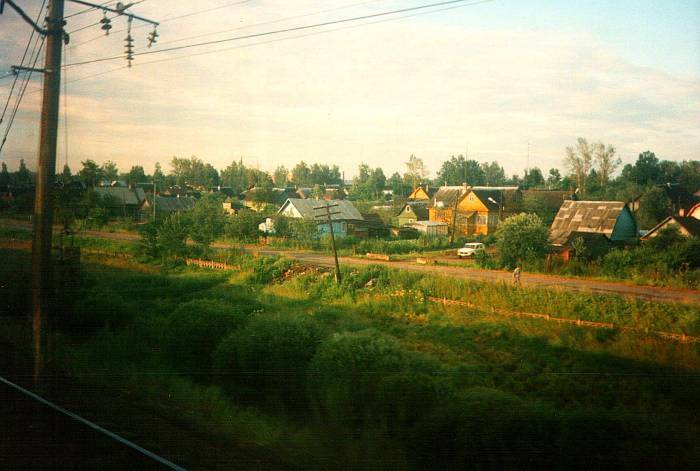 Here is an example view out of a train approaching Moscow in the morning. 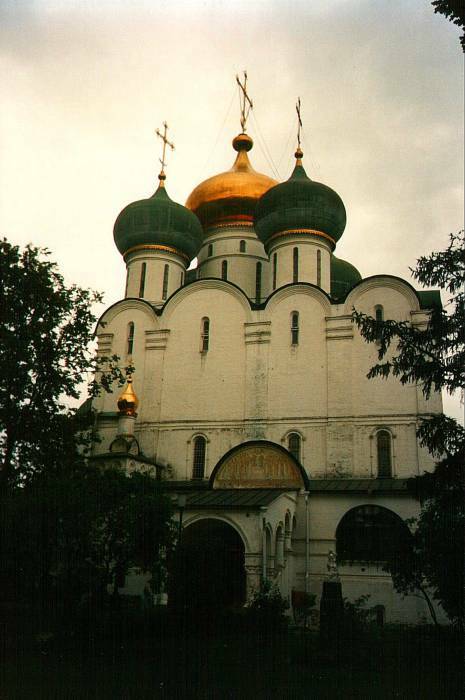 The first time, I got there a couple of days before the Louisvilniki. A friend of mine from high school was traveling around the world about the same time. 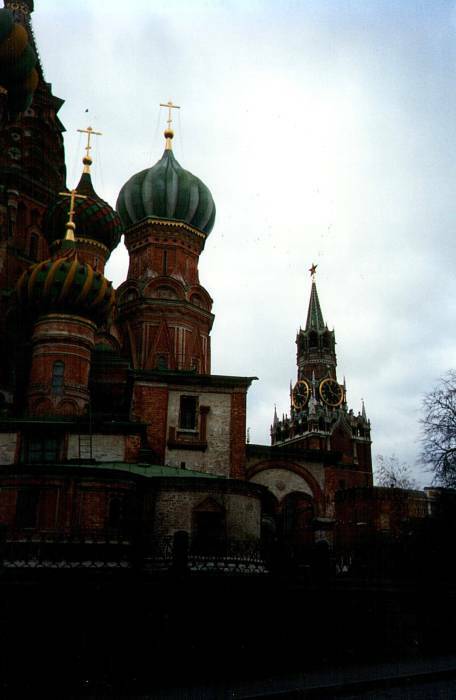 He came into Moscow about the same time on the Trans-Siberian Express out of Beijing. 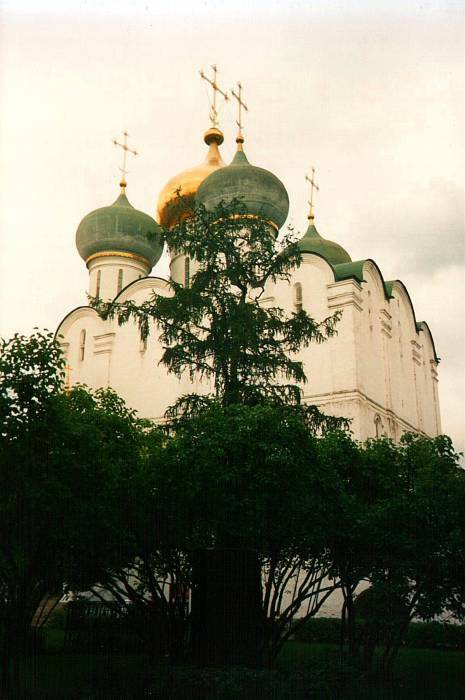 We weren't sure of each other's schedule — he didn't know when I would arrive, and I didn't know if he was even coming from China to Russia around that time. We ran into each other in the hallway at the hostel. 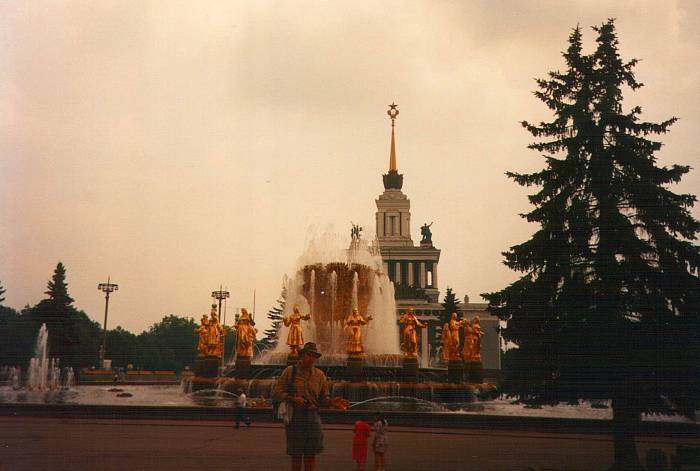 At the time there was only about one budget place for independent travelers in Moscow, so we were both there. We went to the military museum. 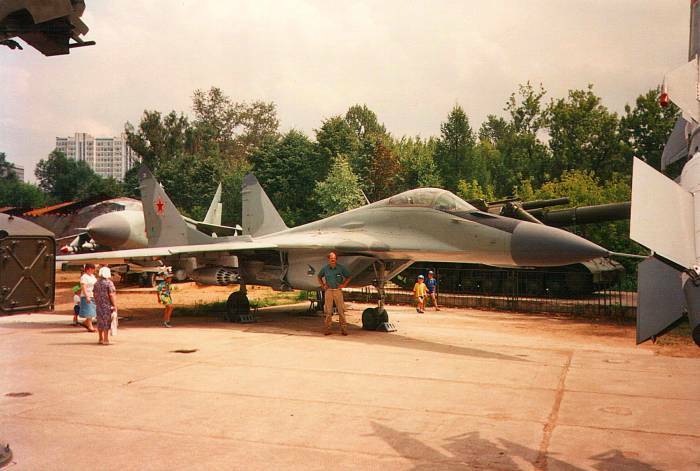 Here I am with a MiG 29, what NATO calls a Fulcrum. 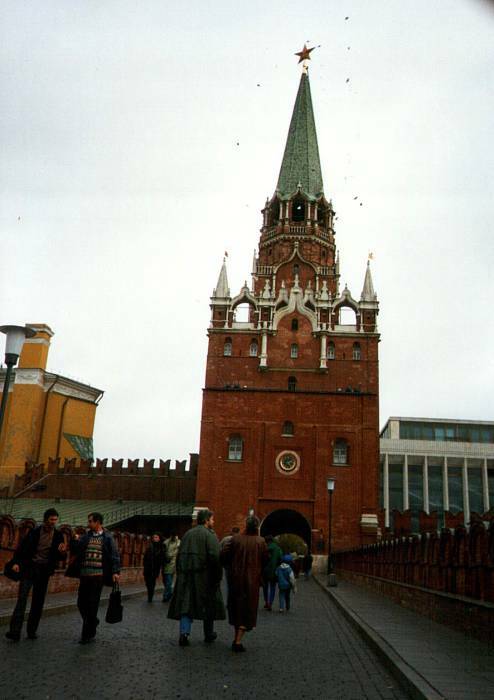 Then it was off to V.D.N.Kh., the Exhibition of the Economic Achievements of the Soviet Union. This sounded like a good opportunity for irony. Think about it: the Exhibition of the Economic Achievements of the Soviet Union. It's a large park with plenty of fountains. Here is the Hall of Atomic Energy, that seems like a good place to start. Wait a minute, it seems to be an appliance showroom. Are these nuclear-powered washing machines? No. 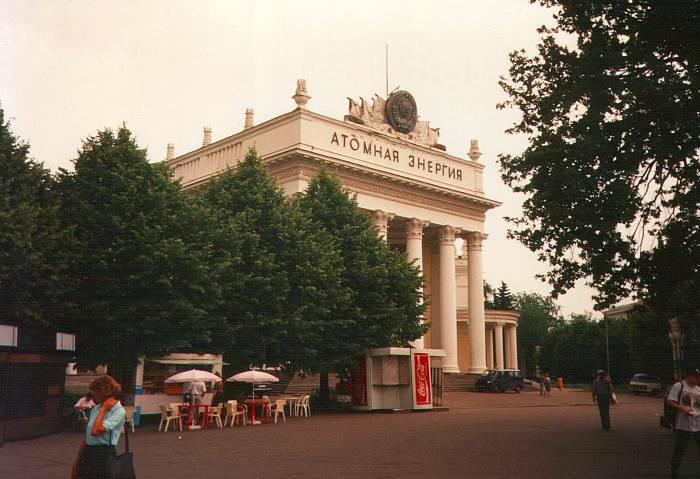 The Hall of Atomic Energy is now a (non-nuclear) household appliance showroom. Here's the Air and Space Flight exhibit. 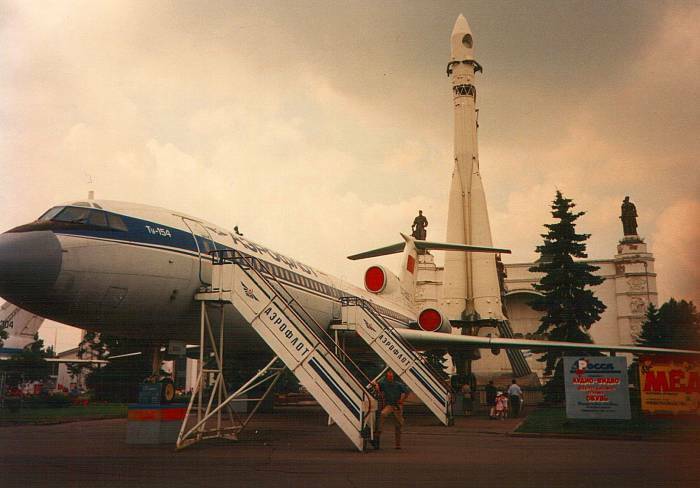 There's a Tupolev Tu-154, and an orbital launcher. Let's go in the exhibit hall and see Yuri Gagarin's flight capsule! There it is, I think. It's pushed back in the corner behind these automobiles a dealer is showing. Kinda hard to tell, it's pretty dark in here. The Economic Achievements on exhibit, or at least the Economic Events, seemed to be: The collapse of the Soviet system and its replacement with enthused but somewhat clumsy capitalism. 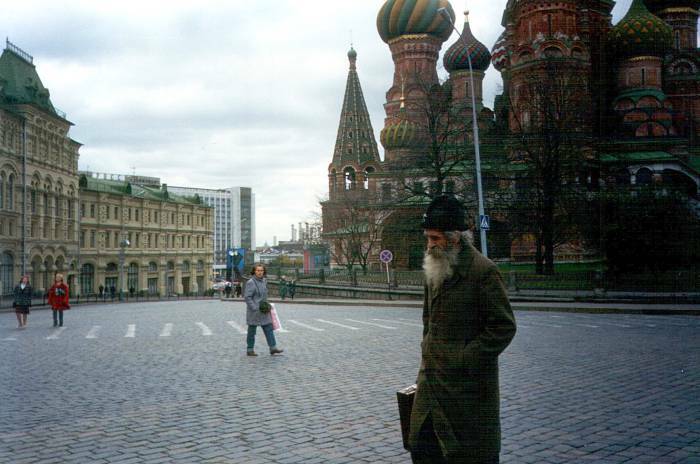 It's me, on Red Square, with the Cathedral of Saint Basil the Blessed behind me. 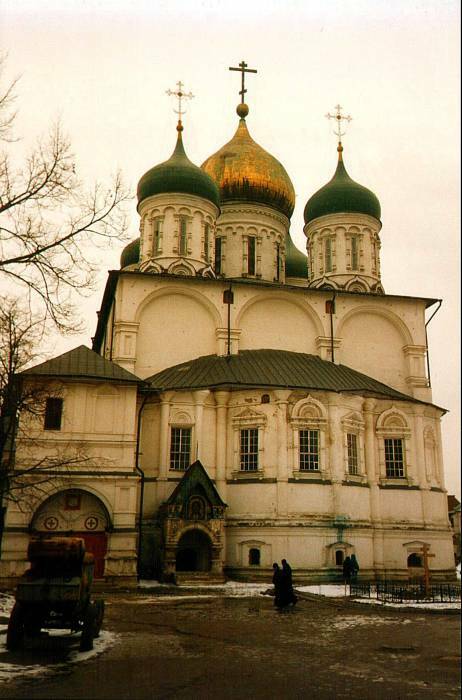 The cathedral was built in 1555 through 1561, during the rule of Ivan the Terrible. 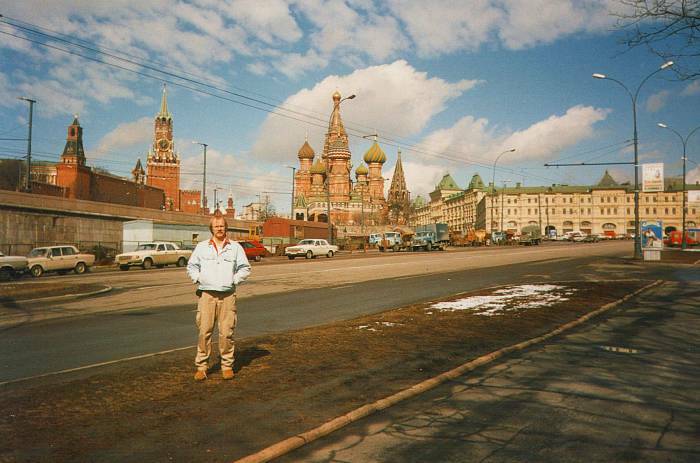 The Rossia Hotel is on the horizon at left in the distance, the Kremlin looms unseen off to the right. 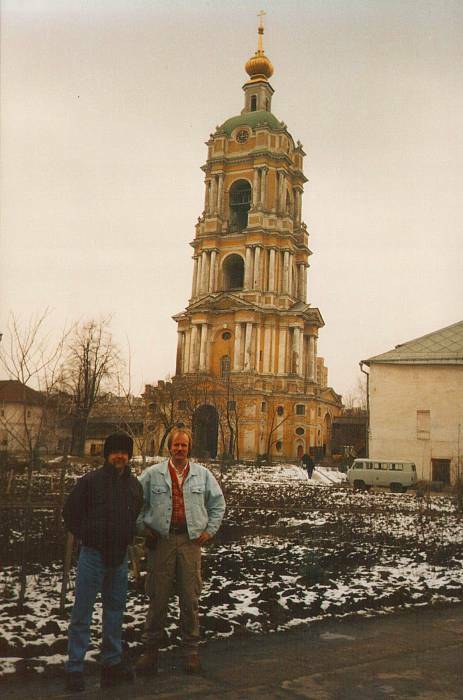 My parents were with the Louisvilniki on two trips. 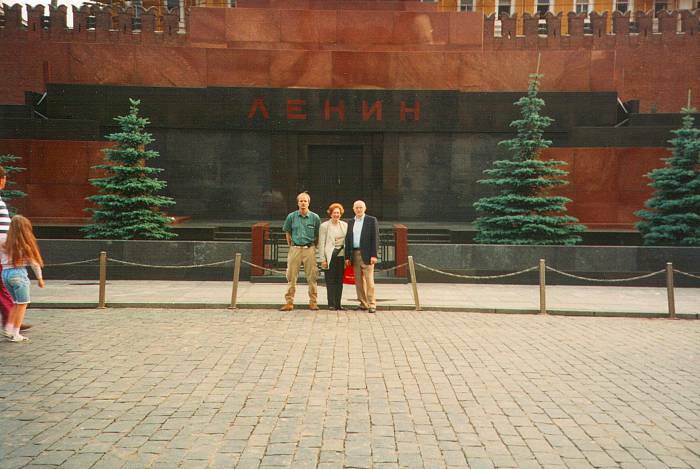 Here we are outside Lenin's Tomb, on Red Square. Yes, he's still in there. Still on view in a glass case. The lines to see him are much shorter now. 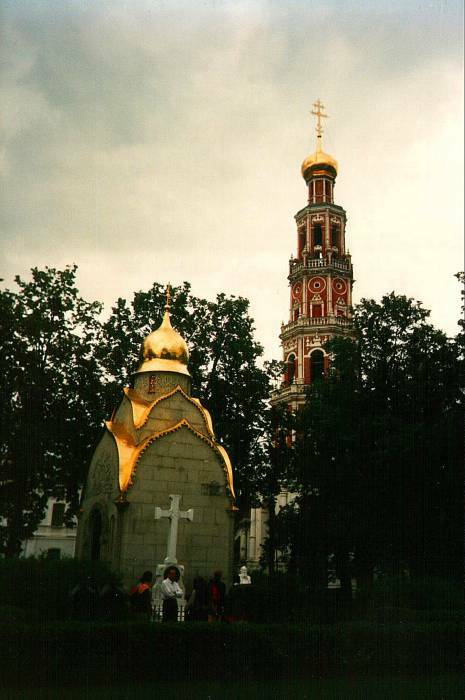 The Kremlin walls and grassy area behind Lenin's tomb contain the tombs of all the other Soviet leaders, except Krushchev, who had fallen from favor and was buried at Novodevichy Convent. 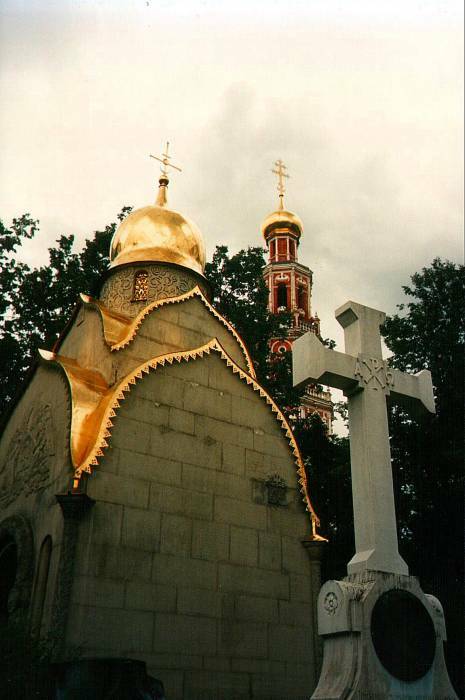 To be complete about things, I've been there to see Krushchev's tomb. 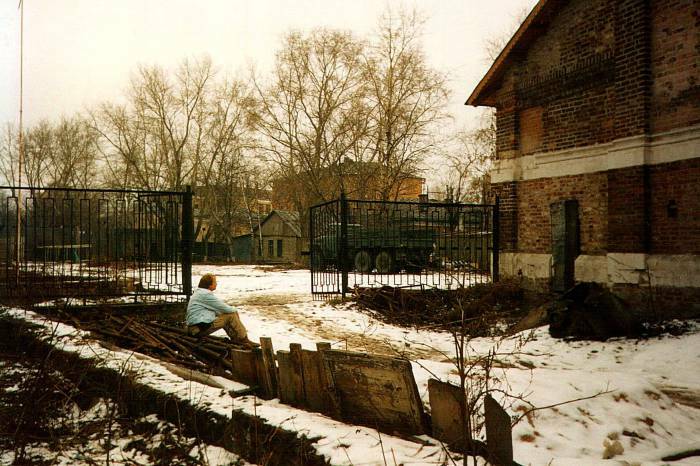 Other heros are buried at the Kremlin like Yuri Gagarin. And there is one American buried there, John Reed. Here I am on another trip, in cooler weather, down by the river. Left to right behind me: the Kremlin, Saint Basil's, and GUM (Gosudarstvenniy Univermag, or the Governmental Department Store). 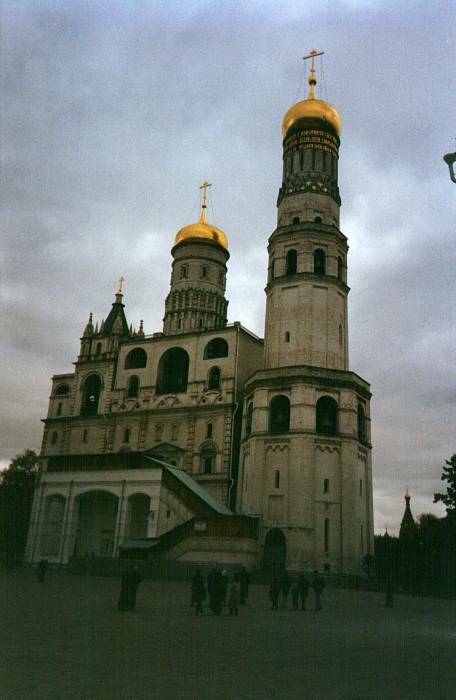 Saint Basil's is close to the Spasskaya Tower, a grand entrance to the Kremlin. Straight from Central Casting, filed under "Classic Muscovite". 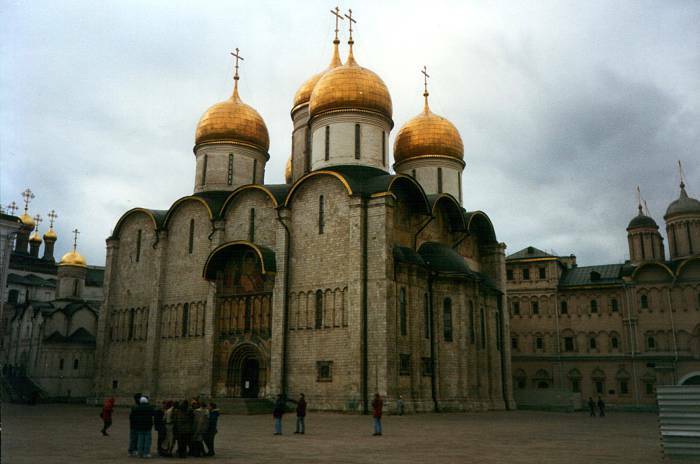 There are many beautiful churches in the Kremlin. Yes, churches. 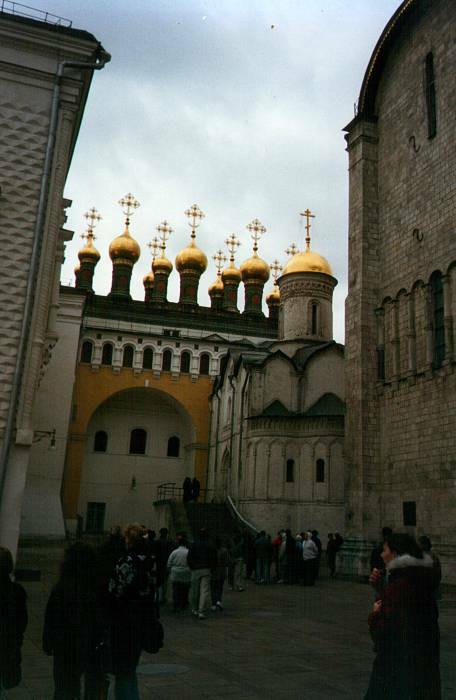 In the Kremlin. 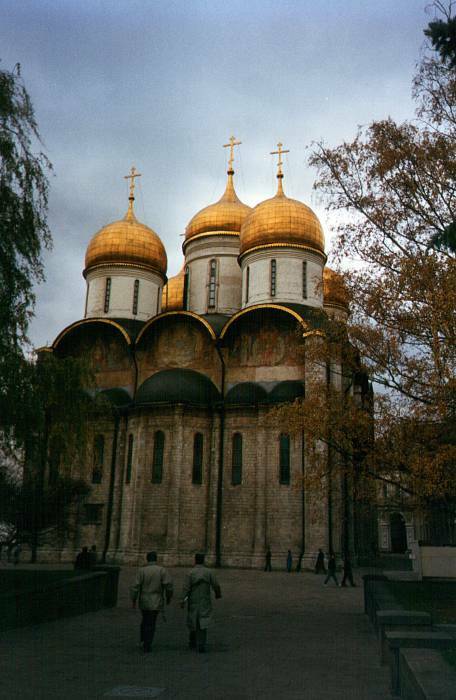 There are lots of other churches in Moscow. 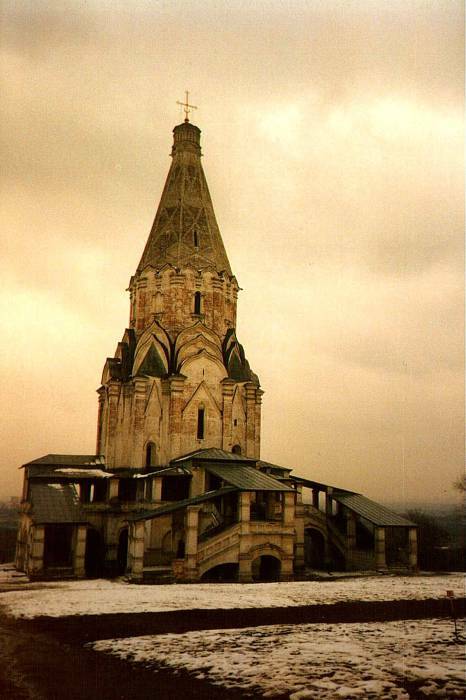 And these are just the very few that survived over 70 years of official atheism and church destruction. Me and one of the Louisvilniki after we had been buying fur hats on Red Square. 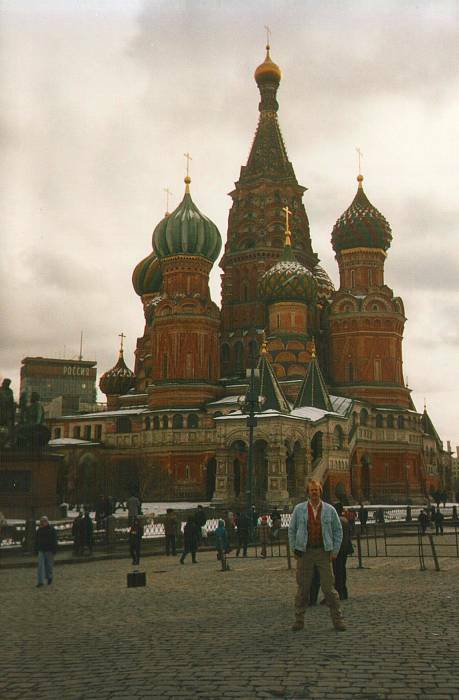 And, me in front of yet another Moscow church. And another, with an unusual design. 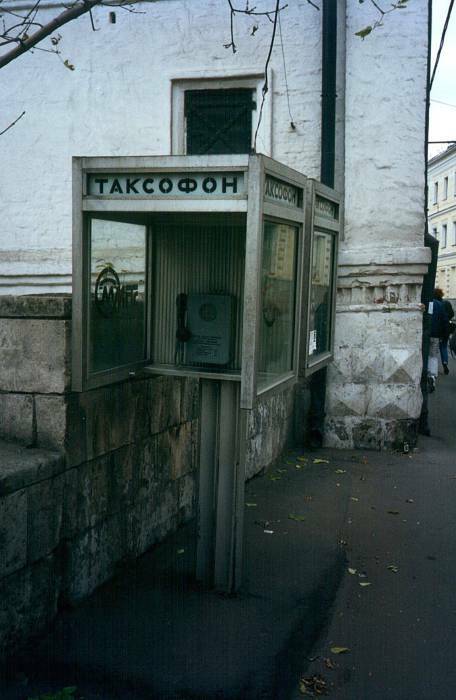 A public telephone, and nowhere in particular. 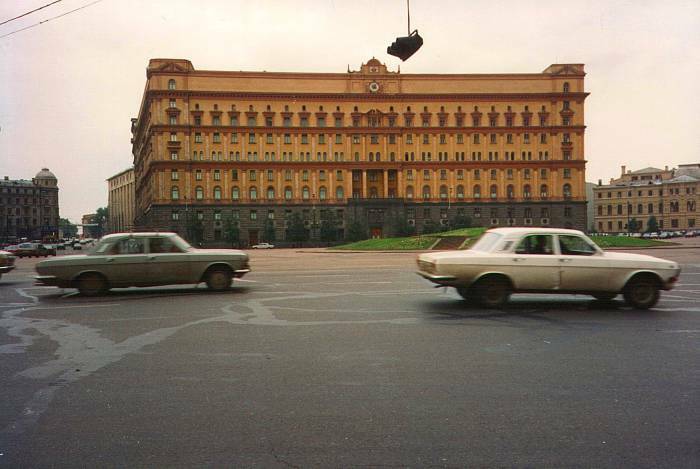 The Lubyanka, headquarters of the KGB, now renamed the FSB, Federalnaya Sluzhba Bezopasnosti. 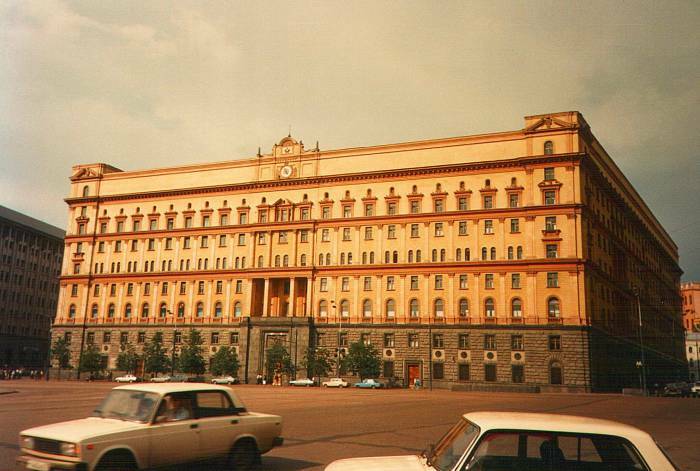 It's on Dzherzhinskaya Ploshchad', or Dzherzhinskaya Square, named for the KGB founder "Iron Felix" Dzherzhinskaya. The Third Ministry includes Minatomprom, aka Gosatomprom, or they're connected, or it's somehow something like that. A part of the Third Ministry is a health ministry, addressing health as it relates to nuclear power, plus public health and fire safety. 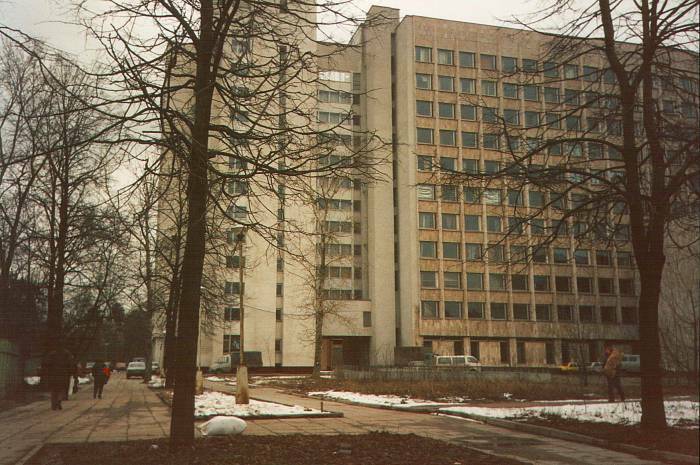 Vladimir Riva was the head of the Third Ministry when Chernobyl blew, and so he was in charge of running the cover-up that lasted a few days until the amount of radiation drifting into Scandinavia and elsewhere made it impossible to deny. Riva ran the thing like his own privately owned hotel. Complete with thuggish security guards, dressed all in ominous black uniforms, slapping their rubber-coated truncheons against their hands. Nice hotel atmosphere. 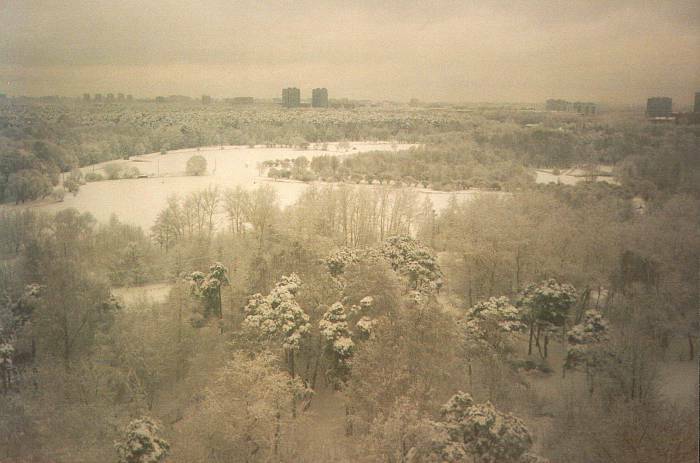 Here is a view across Moscow from The House of the Medical Worker on a snowy March day.